Arita-Yaki is a white, smooth porcelain with beautiful decoration of red, navy or gold. It’s a sophisticated porcelain with oriental atmosphere which is also popular in foreign country. In Dresden Museum in Meissen, Germany, there are a number of old Japanese porcelains exported from Japan during 17th century. Let’s look back at the evolution of Arita-Yaki together with its history. Arita-Yaki is a porcelain made in area around Arita-Cho in Saga prefecture. It is said that ceramic production in Arita-Cho started at the beginning of 17th century. The catalyst of Japanese ceramic production was Imjin War by Hideyoshi Toyotomi. The master of Hizen (current Nagasaki and Saga prefecture) brought Korean ceramic artisan back with him when he withdrew from Korea. Sanpei Ri was one of them. At first, Sanpei Ri produced pottery but after going on travel to find appropriate material, he found high-quality magnet in Arita and started using it. Since then, porcelain production in Arita started in full-scale. Sanpei Ri is enshrined in Tozan shrine in Arita as the “ancestor of porcelain”. 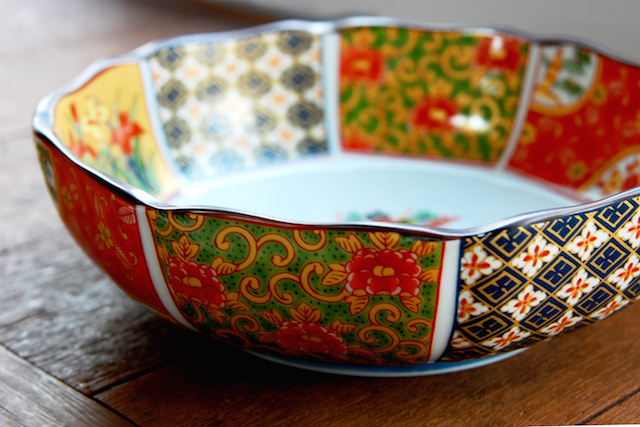 Early Arita-Yaki was influenced by Chinese porcelain and had Chinese decoration with one navy line on white base. 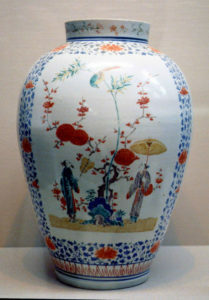 Later in late 17th century, decoration with red line called Kakiemon Style started. Kakiemon Style porcelain was very expensive and was exported to abroad. At the end of 17th century, “Kinrade” with golden decoration started and with such technical development, Arita-Yaki was highly evaluated from oversea. Arita-Yaki? Imari-Yaki? What is the difference between pottery and porcelain? Product such as dish and vase by heating materials are called “pottery” or “ceramic” but there are largely 2 type; pottery and porcelain. Arita-Yaki is one of porcelain. The characteristics of porcelain is that it’s white and makes high sound when clapped. Porcelain is made mainly with powder of china stone and by heating materials in high temperature. It’s light and tough. On the other hand, pottery has less smooth but rustic and warm surface and has excellent water absorbability. It’s made of clay. There are Banko-Yaki and Tokoname-Yaki as famous pottery. 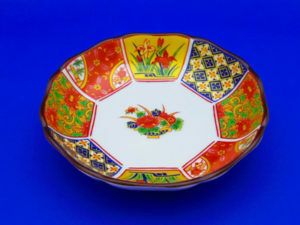 In foreign county, Arita-Yaki was known by the name of “IMARI” so there might be many people who imagine Imari-Yaki as Japanese representative porcelain. Actually, Arita-Yaki and Imari-Yaki used be the exact same thing. The reason it was called differently was that Arita-Yaki was transported from the port in Imari resulting in the name “Imari-Yaki” from the name of the port. Imari-Yaki includes also Mikawachi-Yaki and Hasami-Yaki. Arita-Yaki and Imari-Yaki started to be distinguished by the town of its production after modern times when transport was changed from ship to train. The tradition of Arita-Yaki continuing for more than 400 years is still handed down while evolving at the same time. They have new activity called “ARITA” which is a new generation with arranged casual dishes easy to use in current life while protecting their traditional design. 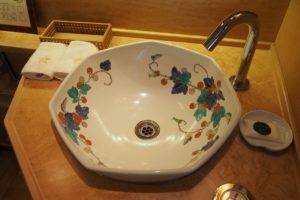 Also, in luxury overnight train ”Nanatsu-boshi” of JR Kyushu, Kakiemon Style Arita-Yaki is used as lavatory bowl to decorate the journey on train. Every year, during Golden Week, there is Arita Pottery Market and more than 1 million people visit Arita-Cho. There are a lot of limited edition and excellent bargain so please visit once.